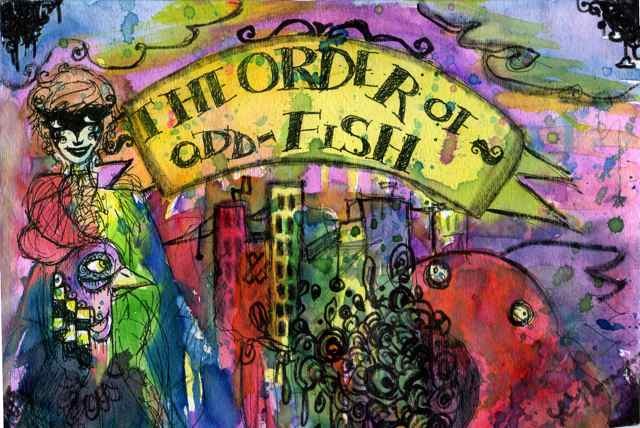 I still haven’t blogged all the incredible Order of Odd-Fish fan art that we featured in the Odd-Fish gallery show in April. There’s still great art to see! Today I want to spotlight two young artists who also happen to be two young Lauras. The wildly gorgeous banner above is by Laura-Jayne Nailor, also known as macabrexheart on DeviantArt (although it looks like she hasn’t updated her profile in a while). I was hoping Laura would do something like this! It has exactly the kind of unhinged, colorful, whimsical feel I admired in her other work. I particularly like the Mardi Gras mask Jo is wearing and the way the ostrich is totally unimpressed by the vomiting fish. The multicolored buildings of Eldritch City and the swirls and curlicues bubbling out of the fish’s mouth makes the whole banner feel fizzy, bursting, and alive. Great work! 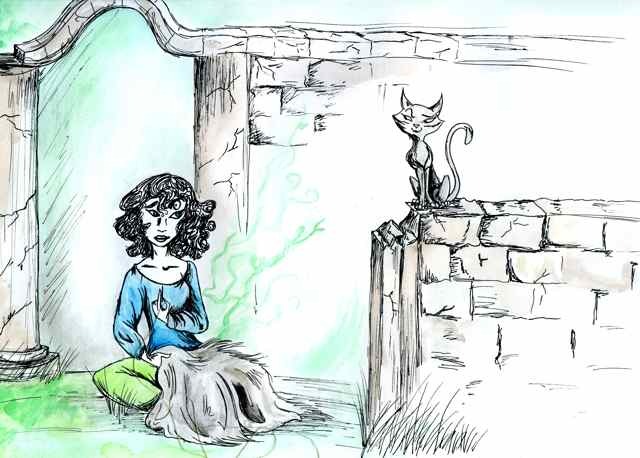 The next two pieces are by Laura Moriarty, whom I met on Goodreads. She had given a very nice review of Odd-Fish, so I thanked her and told her about the upcoming art show. Luckily, it turned out Laura is a first-rate artist! Bravo! 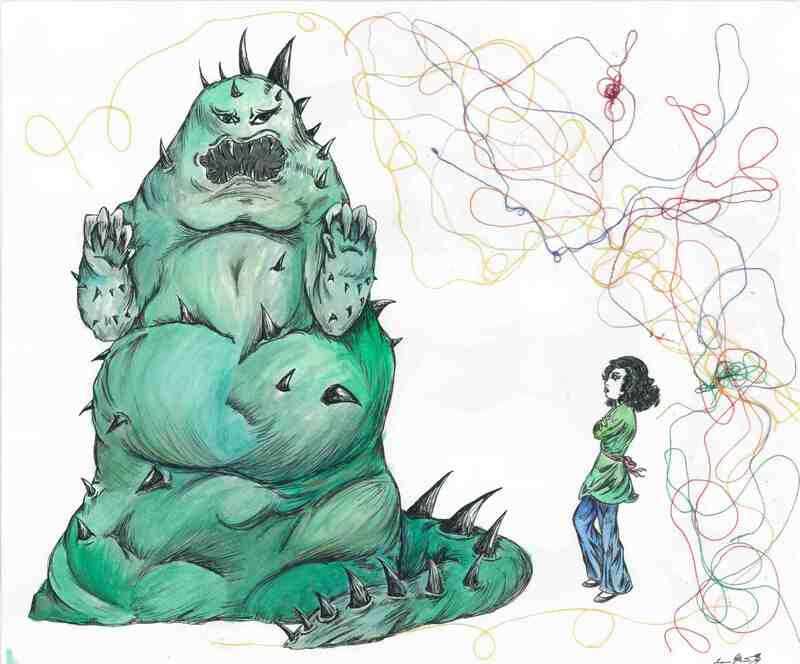 The squishy, fatty, spiky, growling monster is great, but what makes it even better is the tension between it and the cool, appraising gaze of Fiona as she surveys her work. I also like how Laura paid special attention to Fiona’s clothes — that neat pink sash setting off her flowing green blouse and jeans. You kind of can’t tell from these pictures, but both pictures have actual thread pasted to them (threaded into Jo’s needle, and a tangle of multicolored threads connected to the Ichthala idol) that cleverly reference the way the Ichthala goddess is stitched together, and the gold thread that pulls it apart. And the threads serve to tie the two pieces together. Ingenious! Thank you, Laura Moriarty and Laura-Jayne Nailor! I was proud to feature your art in the show.